The cabin was in a great location with a nice view. 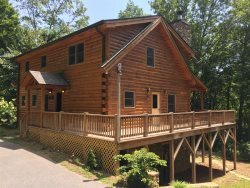 We have stayed with GSCR four times starting in May 2018 and have a cabin for Oct. 2019.Its hard to find a great company like GSCR with very helpful employee's. We loved this beautiful cabin deep in the woods. The fireplace was warm and cozy on the cool fall nights. We enjoyed walks to look at the incredible fall colors. Your cabin was warm and cozy, well stocked and provided a peaceful break from the city stress. We loved the Hot Tub! Would not hesitate t stay again. Lovely and comfortable cabin. Beautiful sunset colors our last night. The info binder was very useful. We had a great time at Cherokee, Deep Creek, on the Smoky Mtn. RR, at Nantahala, and visited Fontana Dam. We enjoyed the shops in downtown Bryson City. The cabin was beyond our expectations. It is first class. The team at GSCR was very courteous, professional and knowledgeable. We enjoyed being out of the Florida heat and humidity. We loved the view and the hot tub. This place is awesome - so beautiful. We had to stay an additional 2 days to the week that we had planned. We went out everyday to enjoy this beautiful part of the U.S. It was great to come back each evening to this wonderful home. We came for vacation and enjoyed the hot tub and convenience of the cabin. We went kayaking. The team was very helpful, especially when I was trying to make sure my son's wheelchair would fit in the bathroom. The folks at GSCR are very friendly an knowledgeable. The cabin was great! We loved the location and the hot tub. Cathie was kind and helpful throughout the process. The property was beautiful and better than I could have imagined! We loved the porch and the view! The cabin it exceeded our expectations. The pictures truly did not do the cabin justice! We had a wonderful relaxing weekend at Ridge Runner Retreat and can't wait to return! We loved the dining room! The view is amazing! The staff is very polite and helpful! This cabin is beautiful and very secluded. We celebrated a birthday weekend. The staff at GSCR is extremely friendly. Thank you for allowing my husband and I to spend our honeymoon at your cabin. It was a dream come true. A great weekend away from home. We all enjoyed our time here. It was perfect. We had a blast and enjoyed the cabin. We want to come back. It was amazing 1st wedding anniversary. This was our 2nd trip at this beautiful cabin. We were here in Oct. 2016. We are already planning on coming back again. The cabin was beautiful, spacious, clean, convenient to town and the views were spectacular. Love the cabin. It was paradise, cozy, comfortable, great views. We loved the hot tub, and grilled out each day. Beautifully decorated. We shared beautiful memories that will last a lifetime. This cabin is beautiful and the view was amazing. My family and I enjoyed our weekend. Thanks so much for sharing your cabin.